Last weekend, I had my stint as a makeup artist for an engagement shoot. I must agree that my face looks too bland without makeup. Heck, I'm the makeup artist not the the model so I guess I deserve a pass this time. My friends told me that I look so touristy with my outfit. Yeah! yeah! I just need the hat to protect my face from the sun. Any ways, I find it cool that my shorts matches the background so I grabbed the opportunity and ask my photographer friend to take a few shots. Ahaha! How could I miss it, right? I woke up early for the shoot and wasn't able to sleep the night before thus the eyebags. 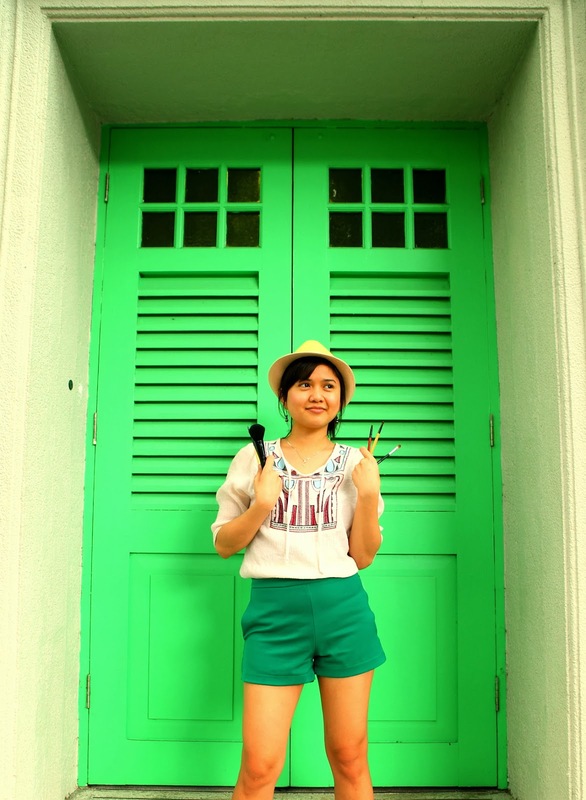 I've been loving high-waisted shorts lately mostly because it helps a petite girl visibly look taller. The secret is to tuck in the top you're wearing. It elongates your lower body giving an illusion of endless legs. u look cute in these pics and the background is nice too!